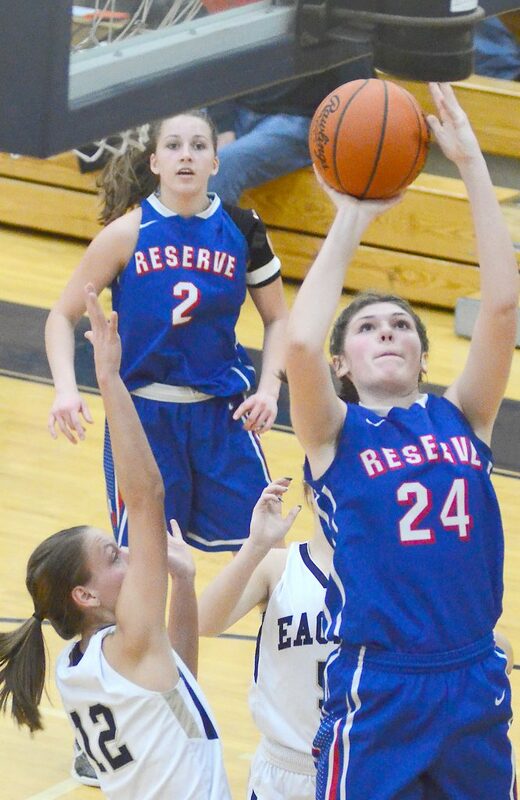 HANOVERTON–Dani Vuletich set a single-game school scoring record as Western Reserve rolled over United 87-37 in girls basketball action Thursday. Vuletich stuffed the stat sheet with 41 points, 10 rebounds, four steals and five blocks. Vuletich scored 10 points in the first quarter, nine points in the second quarter, 14 points in the third and eight points in the fourth. She eclipsed the mark of 39 points set by Anna Marie Ricciardi. Western Reserve is now 17-3 overall. The Eagles fall to 9-11. Also chipping in for the Blue Devils were Kennedy Miller with 13 points and five assists and Alyssa Serensky with 11 points and six assists. Brooke Morris grabbed seven rebounds. Celeste Hofmeister led the Eagles with 12 points. 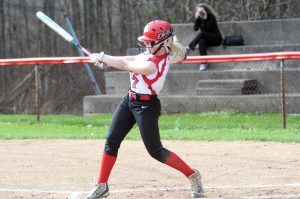 WESTERN RESERVE SCORING: Brooke Morris 2-0-4, Maddy Owen 0-1-1, Abby Gay 0-0-0, Kennedy Miller 4-1-13, Olivia Pater 1-2-5, Erica DeZee 0-0-0, Dani Vuletich 16-9-41, Jenna Heater 0-0-0, Alyssa Serensky 4-1-11, Emma Heater 0-1-1, Alyssa Herron 1-0-2, Morgan Donithan 2-2-8, Olivia Altiere 0-1-1. TEAM TOTALS: 30, 18-26: 87. UNITED SCORING: Loren Swords 2-0-4, Madison Boyle 0-2-2, Harley Salmen 0-0-0, Colby Burton 0-0-0, Kyleigh Daggy 0-0-0, Celeste Powers 3-1-7, Kendyl Daggy 1-2-4, Destiny Hill 3-1-8, Savannah Burton 0-0-0, Celeste Hofmeister 4-2-12, Megan Drake 0-0-0. TEAM TOTALS: 13, 8-10: 37. COLUMBIANA–The Columbiana girls basketball team crushed Mineral Ridge 67-34 on Thursday. Kayla Muslovski led the way offensively and defensively for the Clippers with 31 points and 10 steals. Kennedy Fullum added 12 points and seven rebounds. Tessa Liggett finished with 13 points and five rebounds. Alexa Harkins led the Rams with 17 points. MINERAL RIDGE SCORING: Candice Miller 2-0-4, Morgan Sigley 1-0-3, Fran Kessner 4-1-10, Alexa Harkins 5-7-17. TEAM TOTALS: 12, 8-12: 67. COLUMBIANA SCORING: Tori Long 0-0-0, Karissa Tringhese 0-2-2, Kayla Muslovski 12-4-31, Tessa Liggett 5-0-13, Grace Hammond 4-0-9, Camille Zentner 0-0-0, Grace Witmer 0-0-0, Kennedy Fullum 5-2-12, Madison Moser 0-0-0. TEAM TOTALS: 26, 8-13: 67. GREEN FORD — Izzy Lamparty scored 25 points and Bree Kohler 13 as South Range races past Jefferson Area, 73-50, Thursday. The Raiders improve to 12-8 on the season. South Range won the junior varsity game, 39-26, as Hannah Heikkinen scored 14 points. The Raiders will host Niles on Wednesday. PORTERSVILLE, Pa. — Heartland Christian outscored Portersville Christian in every quarter on the way to a 50-31 win Thursday. Sydney Ogden led the charge with a game-high 23 points. Madi Matthews added nine points and Jeanna Morgan eight. Heartland will play at East Palestine on Saturday. HEARTLAND SCORING: Madi Matthews 4-1-9, Jeanna Morgan 3-2-8, Sydney Ogden 8-4-23, Julia Reynolds 1-1-3, Sarah Adkins 1-0-3, Hannah Rossi 0-0-0, Ambra Creighton 1-0-2, Rachel Wittenmyer 0-0-0, Jorden Webb 2-0-5. EAM TOTALS: 19, 8-13: 50. PORTERSVILLE SCORING: Molly Castina 1-0-2, Madison Dickson 1-0-2, Noel Ledford 5-3-13, Audrey Shandick 1-3-5, Tiffany Konor 0-0-0, Maria Graham 0-1-1, Kayla Kingston 0-0-0, Jaelyn Sanchez 0-0-0, Madison Arblaster 3-2-8. TEAM TOTALS: 11, 9-18: 31. Three-point goals: Heartland 4 (Ogden 3, Adkins).